Innovative Minds and IHRC are calling on campaigners to contact Oxfam Great Britain and protest their decision to collaborate with multinational coffee chain Starbucks. In an agreement announced last week, Starbucks has agreed to contribute £100,000 to Oxfam's rural development programme in the East Hararge coffe growing region of Ethiopia. There are a number of critical concerns regarding this partnership, outline below. In summary. Starbucks’ chair Howard Schutltz is an active zionist whose own activities include running propaganda seminars on behalf of Israel across campuses in both North America and Israel. In recognition for his support of Israel Howard Schultz has been presented with "The Israel 50th Anniversary Tribute Award". Starbucks has sponsored the bowl4isreal event, and despite pulling its stores out of Israel has maintained that it will return in response to questions raised by the Zionist Anti-Defamation League (ADL). We are of course concerned that a humanitarian organization is getting involved with a company that supports apartheid Israel. Oxfam’s double standards in co-operating with Starbucks need to be brought to light. A couple of years ago Oxfam turned down a £5000 donation from Prof Honderich because he defended Palestinians right to resort to violence to fight occupation. ”The charity said in a statement: "The decision to decline Prof Honderich's donation was taken for one reason alone, that Oxfam cannot accept, endorse or benefit from certain opinions given in the book. Oxfam's purpose is to overcome poverty and suffering. We believe that the lives of all human beings are of equal value. We do not endorse acts of violence... No other facts were considered in taking the decision." ”An Oxfam spokeswoman told the JC: ‘We said: No thank you,’ because you condone acts of terrorism and we can’t accept donations from someone taking that standpoint. "It is absolutely legitimate to question the sources of donations particularly when they are associated with business or (in this case) a business deal. Accepting a donation implies a degree of endorsement. But in this case I suspect Oxfam has reacted to a vocal pro-Israeli minority and concerns about potential damage to its future fundraising. All NGOs working in Palestine are well aware of this lobby, which complains on a daily basis about any support given to the opposition." The Oxfam – Starbucks agreement is being heavily criticized by campaigners for Fair Trade. According to the Organic Consumers’ Association a similar agreement between Oxfam America and Starbucks was an exercise in ‘greenwashing’ i.e. Starbucks getting endorsement from a humanitarian organization in return for a minimal donation towards a project that helped its image. We also requests campaigners to raise the issue of greenwashing with Oxfam whose credentials as a promoter of Fair Trade are surely undermined by such an agreement. Donors to Oxfam may consider these issues before making future donations, and consider charities less prone to political manipulation and lobbying. In either case please email us at boycott@inminds.co.uk with the subject line "Oxfam campaign" just to let us know that you have complained, that way we can accurately gauge the response to this campaign. Also please forward us any replies that you receive - this is very important - thank you. I am writing to complain your recent decision to enter an agreement with the pro-israeli multinational Starbucks. As you will know Starbucks is the target of a worldwide boycott for its support of Israeli apartheid (see www.inminds.co.uk/boycott-starbucks.html). It is shameful that a humanitarian organisation like Oxfam can be bought out by a multinational, and that for a paltry £100,000. "The decision to decline Prof Honderich's donation was taken for one reason alone, that Oxfam cannot accept, endorse or benefit from certain opinions given in [Honderich's] book... Oxfam's purpose is to overcome poverty and suffering. We believe that the lives of all human beings are of equal value." So then by accepting Starbucks money Oxfam is clearly endorsing their support for israeli apartheid. Apparently the lives of Palestinians, suffering under occupation, are worth less to Oxfam and can be bought for £100,000. You cannot claim to help people with one hand whilst at the same time with the other hand endorse their oppression. I am disgusted by this sell out and double standards. I will no longer support Oxfam and will urge others to do the same. I would like an explanation for your decision in partnering with Starbucks whilst knowing that it supports apartheid Israel. Thank you very much for your message to Oxfam in which you expressed your concerns regarding the involvement of Starbucks in supporting Israeli actions in the Middle East. Your feedback is important to us as it enables us to assess how our work is being perceived. Oxfam is an internationally established and renowned aid organisation that delivers projects in over 80 countries around the world aimed at reducing poverty and suffering. We work largely with other organisations and due to Charity Commission guidelines take great care in choosing those who we develop partnerships with. This maintains our integrity and professional reputation. It is important to note that this collaboration with Starbucks is purely about working with coffee farmers and improving their livelihoods. We believe that by working together we can achieve a great deal for these farmers. Independent organisations have verified that of all the specialist coffee companies Starbucks leads the way with its policy of ethical purchasing and corporate social responsibility. It consistently pays more than double the current market price for its coffee compared to other major coffee roasting companies. Nevertheless, it has pledged to increase further their purchase of Fairtrade coffee and also to develop ways to benefit coffee-growing communities. With respect to your concerns we have found no evidence that Starbucks as an organisation is pro-Israeli. Starbucks have made it clear that any comments made by Mr. Schultz were made as a private citizen and not in his capacity as chair of Starbucks. At the time of the original allegations against Mr. Schultz, Starbucks said: "Starbucks is an international company, wherever we operate we embrace diversity and strive to be locally relevant. Starbucks has no involvement or interest in politics anywhere in the world." We are therefore happy to enter into collaboration with them and accept a donation to fund the work in Ethiopia. Starbucks UK already has some experience of relief work in southern Ethiopia. They have been working on developing health, clean water and education schemes in Bensa Ware. However, if we feel that any of Starbucks business practices are or become inconsistent with the aims and goals of this collaboration we will review our relationship with them. We are viewing this collaboration with Starbucks as an excellent opportunity to demonstrate the benefits that can come from non-governmental organisations working with private businesses. It will also further publicise Fairtrade practices to other organisations. You also mentioned Oxfam's rejection of Professor Honderich's donation in 2002. The reason for that was due to the gift being from the royalties of his book in which he justified targeted violence against civilians. I hope that you appreciate that our collaboration with Starbucks is very different from the Honderich case as that would have severely compromised Oxfam's principles. Oxfam has a considerable presence in the Palestinian Territories and is working hard to prevent humanitarian disasters and the urgent need for civilian protection. Oxfam has been working in the Palestinian Territories (West Bank and Gaza Strip) and Israel since 1949 where we are advocating for a just and peaceful solution to the conflict. I hope that this has addressed your concerns and if you have any other query please do not hesitate to contact us. I am disappointed by your reply. Its interesting how you so easily separate Schultz from his company in order to facilitate your business with Starbucks. If the Chairman of a company was a proud nazi would you do business with the company if they said that their CEOs nazi activities were a private matter not related to the company even though they proudly displayed his award for best nazi on their company website? Thank you very for taking the time to get back to us. Please allow me to explain further what prompted Oxfam to enter into a partnership with Starbucks. The initial contact between Oxfam and Starbucks was caused by the developing coffee crisis in 2001 when coffee prices slumped. This resulted in Starbucks providing information on its coffee purchasing practices for a report by Oxfam entitled 'Mugged: Poverty in your coffee cup'. A recent update has found Starbucks to be a leader in responsible coffee purchasing including Fairtrade. Starbucks has imposed upon itself purchasing guidelines that are much more rigorous that those set out by the Common Code for the Coffee Community. Starbucks rewards suppliers who meet key quality, environmental, financial and social criteria. Oxfam and Starbucks are both very concerned about the coffee crisis as neither organisation wants to see the production of coffee curtailed. This joint vision has under-pinned the drive towards a mutually beneficial collaboration between Oxfam and Starbucks. During the negotiations Oxfam has remained independent from Starbucks. This is essential such that we maintain our credibility, reputation and therefore our influence as a non-governmental organisation (NGO). Oxfam remains fully independent of Starbucks, we are not spokespeople for the company and we would criticise Starbucks as we would any other company if we felt that any of their business practices were inconsistent with the goals and values of this collaboration. Starbucks will also help Ethiopian farmers get a fairer price for their products and open up new markets for their coffee. This contributes to the economic recovery and stability of 700,000 smallholders in Ethiopia that depend upon coffee for their livelihoods. Starbucks UK already has also some experience of relief work in Southern Ethiopia. Just to reiterate , we believe that Mr Schultz remarks were made as a private citizen, not as his capacity as CEO of Starbucks, and therefore should not affect the collaboration between the companies.As a commercial organisation they do not get involved in international or local politics. We will continue to work with Starbucks for as long as we consider the collaboration to be contributing to the reduction of poverty and suffering, and only while we remain happy that Starbucks are continuing in their commitment to consistently improving their buying practices and making efforts to help poor farmers. I hope that this helps understand the choice Oxfam has made when entering into this collaboration. You have totally ignored the two points I raised. Please answer them. 1. If Schultz was a nazi instead of a zionist would you still conveniently separate him from his company and do business with Starbucks? 2. If Schultz support for Israeli apartheid is personal and not related to Starbucks then why did Starbucks proudly display the "The Israel 50th Anniversary Friend of Zion Tribute Award" given to Schultz which "salutes leaders who have played key roles in promoting close alliance between the United States and Israel", on their Awards and Accolades page until recently? If you think that you are still independent of Starbucks, you are deluding yourselves - the blood on their hands is now on yours - that is the price you pay for getting in to bed with such a multinational. Your credibility and reputation are gone - was the £100,000 worth it? This photo of a boycott banner was recently taken in the middle-east. 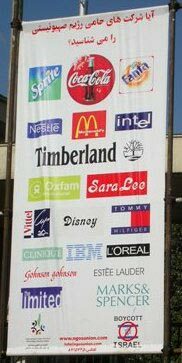 It shows Oxfam's logo along side companies supporting Israel (next to Sara Lee). Interestingly Starbucks doesn't appear on the banner - perhaps this is to highlight the hurt caused by Oxfams betrayal to people who had once regarded it highly. Oxfam's reputation in tatters - all for a meagre £100,000. We are proud to announce that, following a series of discussions with Oxfam regarding its agreement with pro-Zionist multinational coffee chain Starbucks, Oxfam has decided, just 4 months into the contract, that it will not be renewing its 1 year contract with Starbucks, which terminates this September. We would like to thank all activists and organisations who have campaigned to ensure Oxfam adheres to its stated values and principles. This victory shows what is possible when people come together and stand united in the struggle for justice. The Islamic Human Rights Commission and Innovative Minds, supported by Friends of al-Aqsa, the Palestinian Return Centre, the Muslim Association of Britain, and the Scottish Palestine Solidarity Campaign, have been in a series of discussions with Oxfam regarding its agreement with pro-Zionist multinational coffee chain Starbucks. IHRC is proud to inform campaigners that Oxfam is soon to announce that it will not be renewing its 1 year contract with Starbucks, which terminates this September. In October 2004, it emerged that Starbucks had agreed to contribute £100,000 to Oxfam's rural development programme in the East Harare coffe growing region of Ethiopia. (Please see the Innovative Minds page dedicated to this at: http://www.inminds.co.uk/boycott-oxfam.html). IHRC and Inminds would like to thank all campaigners and organisations who have struggled to ensure that Oxfam continues to adhere to the humanitarian values and principles which have guided it throughout its history. It is a sure sign that victory is achievable only when those struggling for justice stand united in their efforts for the common good. IHRC requests all campaigners to contact Oxfam to show them your appreciation for what is a huge victory for common sense.